First of all, technology does no good if there are no skills to use it with. No, I’m not talking about great programming or software development skills, but instead very fundamental skills that can’t be assumed to be present. Typing: I’m an OK typist now, but I’m sure that I lost a few thousand dollars in my early career as a translator because I never had formal training and was very slow at first. Take the time to go through some kind of typing course to increase your productivity. Make sure that you learn to type in your target language on a target language keyboard (and learn how to install different language keyboards on your computer). Also make sure to learn how to use as many keyboard shortcuts as you can so that you have to use the mouse as little as possible. Word processing: You’ll need to be confident with basic office software, especially word processing. This does not have to be MS Word, though I would recommend it. You should know how to use advanced search-and-replace features, be familiar with complex formatting and styles, have a good handle on tools like templates and format painting, and know what you should not do in MS Word (such as working in HTML files). Browsing and querying: It’s important to know the basic syntax of more advanced search queries and have a good idea of locations where you can find answers (and those don’t have to be only dictionaries). I would recommend tools like IntelliWebSearch that enable you to find online content right from your desktop. You also will want to know how to quickly find information on your desktop or cloud-based personal storage. Basic computer maintenance: You don’t have to have the skill level of a system administrator, but you should know the basic steps for how to keep your computer in good shape and running more or less seamlessly. You say you can also have your tech guy do this for you? Sure, but the last time I checked, that resulted in lost productivity and income. Code pages: You need to know what Unicode is, how to make a basic code page conversion of text-based documents, and in general understand what code pages are and why they are relevant for translators. Operating system: I don’t care! I personally use Windows and I’m happy with it because I never have to worry about that very question. (So far I’ve never encountered any client who wants me to use an application that is available only on a Mac.) The truth is, though, that it’s becoming more and more irrelevant. You can virtualize Windows on Mac or Linux computers, work in programs that are supported by various operating systems (such as Java-based programs), and, most importantly, more and more translation jobs are moving into a browser-based system, anyway. Office programs: Same answer as for the operating system: I don’t care. Yet, it’s just a lot easier to have a copy of MS Office so I don’t have to worry about conversion issues with files that clients send me. Translation environment tool or TEnT (aka CAT tool): The first thing you’ll need to do is look at a) what kind of materials you’re translating and b) what kind of clients you are or will be working for. The kind of material might determine whether it’s important to have a translation memory (it might not be so important if you work with highly creative material), and the client might prescribe a certain tool or at least your ability to work in the format of a certain tool. (Many translation environment tools often support the interim formats of other TEnTs). To come back to the first criterion — the kind of materials you’re translating — it doesn’t really matter what it is; you will still want to manage your terminology. If you’re looking at only doing that, you might want to use tools like Lingo or Xbench (and there are many other tools that manage terminology as well). While these tools don’t directly interact with your translation process, it’s very easy to access the terminology content that they maintain for you and it’s also easy to quickly add more. If you are working in projects where it would be helpful to access previously translated material (which essentially is the case for any and every technical, legal, medical, or other functional translation) and/or you’re working with many different file formats and/or you’re working in teams with other translators, you will want to use a full-blown TEnT (which will not only provide the translation memory feature but also terminology maintenance, QA features, file conversion functions, and many other tools). You might eventually end up using (and buying) several tools, but you need to make a decision where to start and which tool brings you the furthest. Don’t start with a “cheap” tool just because it’s a beginner’s tool. If you use a “cheap” or free tool, use it because that’s the tool you really want to use. And forget about the word “cheap” anyway, because what you’re really looking for is a tool that has a good return on investment. A $10 tool can be a waste of money, whereas a $1,000 tool can be a steal. There are large tools like Trados or memoQ (or others) that are powerful and might give you access to jobs that can only be done with these tools. (These are the kinds of jobs where the translation materials are located on a remote server that can’t be accessed with any other tool.) They might also help you market yourself to companies that look for translators for these jobs. Then there are tools that have a slightly geeky approach like the Java-based OmegaT or CafeTran. These can be very powerful in the right hands, and they provide access to almost any kind of job (except the ones mentioned above). Finally there are the browser/cloud-based tools like Wordfast Anywhere, XTM or MemSource that give you a great deal of independence regarding the kind of hardware (even tablets!) and operating systems you use. They also can work with a large number of formats (though you might have to get a little creative when it comes to working at the beach café without wifi). Here’s the important thing to remember: you can’t really get it wrong. Make sure that the tool has an active and loyal following (most do), and invest in training (either by yourself or through a third party). And don’t think that your productivity will skyrocket immediately. In fact, it might never skyrocket, but it will surely increase if you do it right. You’ll find all these points mentioned in much, much greater detail in my Translator’s Tool Box, a 400+ page ebook that is the ultimate technical resource for beginning and experienced translators. About the author: Jost Zetzsche is an English-to-German translator, a localization and translation consultant, and a widely published author on various aspects of translation. He writes regular columns in the ATA Chronicle and the ITI Bulletin; his computer guide for translators, A Translator’s Tool Box for the 21st Century, is now in its tenth edition; and his technical newsletter for translators goes out to more than 10,000 translators. In 2012, Penguin published his co-authored Found in Translation, a book about translation and interpretation for the general public. You can find his website at www.internationalwriters.com and his twitter handle is @Jeromobot. 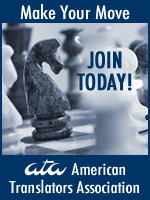 ← Why the American Translators Association? One small disagreement: Typing is SO last century! I am a very mediocre typist but I use an effective voice-to-text program and dictate my translations. I’m faster than any typist I know. That’s wonderful to hear, Gabriel! For the benefit of our readers (and perhaps to initiate an interesting topic), would you mind sharing with us what CAT tool do you use with your voice-to-text software? Thanks! I use Wordfast Pro with Dragon Naturally Speaking. The integration is not (yet) perfect but it is more than sufficient. I agree, Gabriel — I could and should have mentioned voice recognition. The drawback of that is of course that it’s no available for all languages. I enjoyed the article. Thank you! I am a newcomer to this blog. Does accounting software fall into computing? I gave up on my Excel spreadsheet approach and signed up for Quicken Online in late spring. I spent time setting it up with my letterhead and other details so it is now working like a charm. It is the best computing decision I’ve made all year. (Last year’s winner was investing in SDL Trados and MultiTerm and learning how to use them efficiently.) My next challenge is contact/business card management (not my Address book, but all those people that don’t make it into my personal contact list.) I’m using Hello from Evernote. So far so good, though not perfect. I trust it will get better as we users keep making suggestions. I would say all computer tools are computing. I use QuickBooks (a bit of overkill) and I like a lot of its features. Everything you can find that makes your work more organized is good! Keep us posted on how Evernote goes.